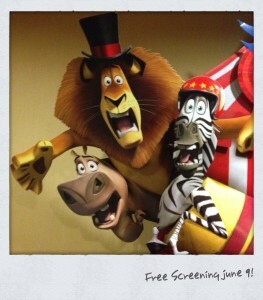 Looking Ahead Program Invites HMB Readers to FREE Screening of MADAGASCAR 3, Sat. June 9! You are here:Home-CHILD STAR STYLE, Free Tickets to Nick & Disney Show Tapings, THE BUZZ-Looking Ahead Program Invites HMB Readers to FREE Screening of MADAGASCAR 3, Sat. June 9! RSVP: Looking Ahead Members: Register online through your Looking Ahead account at www.lookingaheadprogram.org. All other Young Performers: If you are not a member of the Looking Ahead Program, but you are a Young Performer (or parent of a Young Performer) between the ages of 9-18, you and your family are invited to join as our special guests! To RSVP, please send us an email with the subject, “Madagascar 3: Guest RSVP” to lookingahead@actorsfund.org that includes the name and age of the Young Performer(s) along with the names of additional family members that will be in your party. NOTE: Reservations are required and taken on a first come, first serve basis. If you are interested in becoming a member or learning more about our program, please visit us online at www.lookingaheadprogram.org or give us a call at 323-933-9244! Parking: Parking is available in the Hollywood & Highland parking structure for $2 for up to 4 hours with validation from Grauman’s Chinese Theatre and the Chinese 6 Theatres. Please arrive early. As with most screenings, they overbook to ensure a full house. RSVPs do not guarantee seating. Alex the Lion, Marty the Zebra, Melman the Giraffe, and Gloria the Hippopotamus set out to return to New York after escaping to Africa. Dependent on the mechanical know-how of the notorious chimpanzees and penguins, their plan inevitably goes awry and they find themselves stranded in Monte Carlo, where they try to escape Europe from animal control led by Captain Chantel DuBois by joining up with a traveling circus by chance. Led by the venerable Siberian tiger Vitaly, the animal-centered circus has seen better days. During the course of a tour through a series of European cities that ends in a fabulous big top in the heart of London, Alex, Marty, Melman, and Gloria help Vitaly the tiger, Gia the jaguar, and Stefano the sea lion, rediscover their passion for show business and reinvent circus performance. STARRING: Ben Stiller as Alex, Chris Rock as Marty, David Schwimmer as Melman, Jada Pinkett Smith as Gloria, Frances McDormand as Captain Chantel DuBois, Sacha Baron Cohen as King Julien XIII, Cedric the Entertainer as Maurice and more! The Actors Funds’ Looking Ahead Program works with professional young performers, ages 9 through 18, who live in Southern California. Our goal is to help you and your family thrive amid the unique challenges of working in entertainment, which can include things like balancing family and friends with school, work and auditions; figuring out which kind of school works best for your family; making new friends or connecting with other parents; or just needing to get away from the business for an afternoon and be a teenager. Our social events range from laser tag and beach bonfires to movie nights and sporting events. We help you evaluate school options, make an education plan and visit colleges. Our Members talk to us about life, pressures, family and relationships. We visit the elderly, feed homeless families, do crafts with children with disabilities and give back to the community in many other ways. Joining our Leadership Council empowers you to help create new programming for Looking Ahead, meet new friends, and develop leadership skills. We also help parents in a number of ways, such as sorting through educational options for their children, connecting them with other community resources, hosting periodic social meetings and educational seminars and creating a larger support network of parents who are dealing with similar situations. So you dont HAVE to be part of this organization, right? You can be a random person reading this, and still go?